The essential attraction of the countries of Eastern Europe still visit the TV tower. 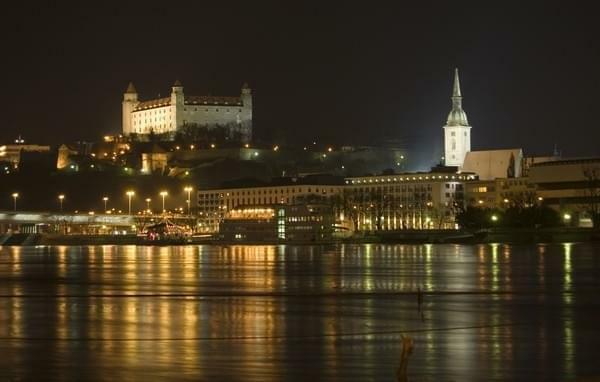 During my stay in Slovakia, so I made a detour to one of Bratislava, capital of the country. The top floor houses the Altitude restaurant has a surprising feature: it turns on itself, offering a magnificent view of the surrounding landscape . We must get out of the city center and climb long in the forest of the Carpathians to reach the tower. Located on Mount kamz & iacute; k which rises to 433 meters, it allows the entire city of Bratislava to receive the television signal. When I finally get a bad surprise: the elevator is out! I have to walk up the 180 meters that separate me from the observation platform. on arrival, but I am breathless captivated by the vision that awaits me: to the west, the whole city stretching for kilometers. I see in the distance Bratislava Castle and the Church Blue, recognizable by its inimitable color. To the north, the whole forest Carpathian unfolding of sight. The fog that blanket parts gives an almost supernatural aspect to the landscape. After strafed photos each piece of the territory that surrounds me, it's time to climb to Altitude Restaurant, which bears his well (only one floor, phew!) name! Tablecloths white, dark draperies and piped music, everything indicates that I landed in a pretty classy place. The large windows make this a very bright room. The fog has disappeared and the sky is cloudless: perfect conditions for the experience I'm about to live. Indeed, the real benefit of this restaurant is the view it offers: the tables are fixed on a turntable that rotates around its axis. Turning is slow enough not to hurt the heart: a complete tour lasts about 20 minutes. Enjoying an excellent filet mignon, and I can enjoy a 360 & deg ;. A superb experience! The TV tower is located in a desert area, with nothing to see in the area . The restaurant is closed on Monday and Tuesday . Pick a fine day to make the most of the panorama . From Paris, 2h30 flight to Bratislava . From the city center: Stationary Hodžovo N & aacute; mestie (behind the Presidential Palace), take the trolley bus & deg; 203 and get off at Koliba . From here, a cable car takes you on Mount kamz & iacute; k in 15 minutes. The route is then arrow up to the TV tower. Approximately 20 minutes climb up the TV tower . At the restaurant, the service is sometimes a bit long so expect a minimum 1 hour for a full meal . The city of Bratislava in itself, with its castle and the Blue Church A cruise on the Danube A bike ride in the Vienna Forest (60 km by car).